Polymer clay has to be one of the most flexible tools ever designed for crafters. It really doesn't matter what type of project you're looking to create, clay can almost always help you achieve your goal. This project is a good example. I buy economy priced tissue boxes, but while I save money on the tissues, I have to put up with looking at the cheesy packaging. So I came up with a way to make tissues available around the house in a really attractive way. It's like a work of art that slips over your ugly store bought packaging. While I created this one in copper and warm colors that compliment my home, you can create the same project with a color scheme that perfectly suits your environment. Before you begin, condition all clay colors. Cutting should be done on plastic film or wax paper which will allow you to easily rotate the work when necessary. step 1 - Use a craft knife to create a card stock stencil with leaf details that will fit inside the borders of your leaf cutter. Use two cutter sizes and cut two stencils for each size. Glue the duplicates together. Lay a book on the stencils until the glue sets. While it's possible to create the stencil with one layer of card stock, a double thickness will provide deeper texture to the leaves. When using card stock to make impressions on clay, the clay may start sticking to the card stock after two or three uses depending on the paper quality. If this happens, gently scrape the clay from the stencil using a craft knife. Prevent further sticking by rubbing the stencil with baby powder. step 2 - Create a cardboard box to fit over your empty tissue box. Not all tissue boxes are created equal so measure the four sides and top of the product you buy and cut cardboard pieces to match but add an extra .25” to the length of the pieces. Use painters tape to hold the pieces together. Cover the cardboard with foil. This will be the form for your clay so make it as smooth and as accurate as possible. step 3 - Remove the plastic from the dispensing end of the tissue box. Slip the box into the cardboard form with the bottom of the box against the top of the form. Keep the box in the form throughout this process. step 4 - Cover your surface with wax paper. Roll out five clay pieces on the number two setting of the conditioning machine. Cut four to match the sides of the box and one to match the top. (You’ll note the colors in this project change from white clay to copper. I didn’t have enough copper clay for this entire project so I made the box from white clay then covered it with super thin copper.) Place two side pieces flush together without overlapping. With your fingers, push the edges together then blend them by smoothing in a vertical motion. Keep adding side pieces and blending the seams until you have one continuous piece. Fit it around the form. Bring the last two edges together and blend the seam. 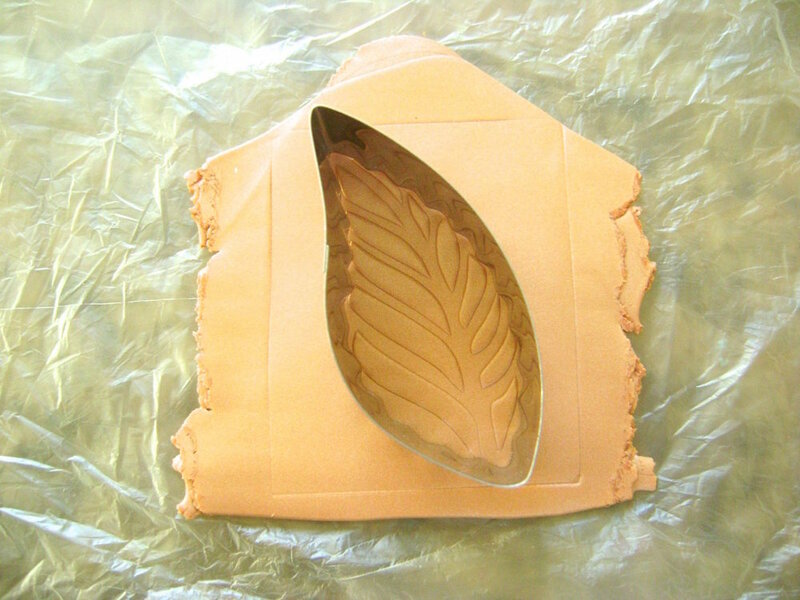 step 5 - Use the leaf cutter to cut a hole in the center top piece of the clay. Set the piece over the form and blend the edges with the side pieces. step 6 - When all seams are blended, apply texture to the clay. This is an invaluable step because the texture will camouflage any imperfections in the clay including dents from fingernails or handling. Apply as many textures as you like. For my project I used lace, followed by a clay texture sheet. To transfer the design of the lace fabric onto the clay, drag across it with the edge of a credit card. Add the second texture by pressing a Sculpey “Edgy” Texture sheet onto the clay. step 7 - Working on wax paper, use a roller to transfer your stencil design onto clay that has been passed through the conditioning machine on #2 setting. step 8 - Wrap the clay around a toilet paper roll. Don’t stretch the clay in the process. Blend the ends together using your fingers until the seam is invisible. step 9 - Roll silver clay out on the machine’s #2 setting. Cut out three stars with a star cutter. Place them over the seam. step 10 - Use a makeup brush, Q-tip, or thin craft brush to color the leaves with gold, green, and red powder. If your powder accidentally lands outside the borders, just remove it with a damp, thin paintbrush. Gently blot the moisture with a paper towel, which will eliminate the moisture. step 11 - Arrange the leavesand vines on the clay box, pressing them gently enough not to distort the design. step 12 - Stand the project on a parchment lined cookie sheet in a 275 degree oven for 30 minutes. Allow the project to cool completely before handling. step 13 - Pull the empty tissue box out of the box form. To remove the form, gently loosen it away from the clay on all four sides. Then pull the form out of the clay. Sculpey Clay - Copper Accents clay approximately 13 oz.